Nothing is more evocative of a Sussex spring than a walk through a wood awash with bluebells. Their deep violet-blue colour and distinctive bell-shaped flower make native bluebells one of our best known plants. We are lucky enough in the UK to be home to half of the world’s total population of bluebells and spectacular displays can be seen across most of Britain, particularly in the South. Native bluebells are usually associated with some of our most ancient habitats, especially ancient woodland and ancient hedgerows, they can also be found in some grasslands. They spend most of the year as bulbs underground, only emerging to flower and leaf from April onwards, with peak flowering times usually between late April and late May. This early spring flowering allows bluebells to make the most of the sunshine that is still able to penetrate through to the woodland floor before trees come into full foliage and shade them out. Their rich nectar provides food for many butterflies such as brimstone, orange-tip, and peacock along with other insects including lots of newly emerged queen bumblebees. Eridge Rocks near Tunbridge Wells. Mention bluebells and it is easy for people to conjure up an idyllic image of woodlands carpeted with soft bluebells shimmering in the spring sunshine, but unfortunately this may not always be the case. Our native bluebell is under threat from habitat destruction, illegal collection of bulbs, climate change and competition from non-native species. Native bluebells are often found in ancient woodland, an irreplaceable habitat that has been around for many hundreds of years. It is our riches and most valuable wildlife habitat, but ancient woodland now only covers around 2% of the UK. Ancient woodland is not protected by law and only receives minimal protection through the planning system. This means that much of what we have left is being lost to development and inappropriate woodland activities, along with the bluebells and other woodland flowers it contains. Spanish bluebells are popular with gardeners because they are much hardier than our native variety, however more and more Spanish bluebells are being discovered in the wild infiltrating our native bluebell populations. They can crossbreed with our native bluebells to form a fertile hybrid, which is an issue because it dilutes the unique characteristics of our native species and may eventually outcompete it. When buying bluebells check the label for the scientific name. Native bluebells are called Hyacinthoides non-scripta whilst Spanish bluebells are names Hyacinthoides hispanica. Should you wish to dig up the non-native variety of bluebell from your garden or land, please dispose of them carefully. The bulbs should be left in the sun to dry out for as long as a month to kill them and only composted once they are dead. Please note it is only legal to dig up wild plants on your own lands, do not attempt to remove Spanish bluebells from land owned by others. So how can you tell the difference between native and Spanish bluebells? Unfortunately hybrids are common and they have a range of intermediate characters. Native bluebells were once harvested by the thousands to sell to gardeners. This became such a problem that digging up bluebells for commercial sale is now illegal under Section 13 of the Wildlife and Countryside Act 1981, however illegal harvesting does still occur. If you want to buy native bluebell bulbs for a garden, try to ensure that they are from a reliable source and have been raised in cultivation, not stolen from the wild. If in doubt, do not buy them. In addition to the concerns over the genetic purity of bluebell populations, there is also concern that the continued shift in climatic temperatures could mean that the bluebell carpets we see today fall into decline. The bluebell has been so successful due to its ability to bloom early, grow rapidly and produce a new bulb before the tree canopy closes and shades the woodland floor. 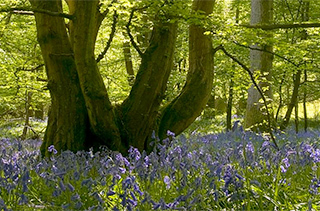 But with predicted mild winters forecasted, the bluebell could lose its competitive edge over other woodland species, as their period of rapid growth shifts closer to that of the bluebell.